9 Great Reasons To Scuba Dive – Diving Is Fun! Divers already know why they’re so passionate about being underwater. Do you want to know? I have 9 amazing reasons to scuba dive. Many people will say ‘we were born on land, why should we be underwater?’. I say why would you not? The vast ocean is here for us to explore and to understand more of our purposes here on earth. Have you ever dreamed and imagined yourself totally submerged underwater and feeling exhilarated the same way your dive friends do after they return from a dive? What did they see? 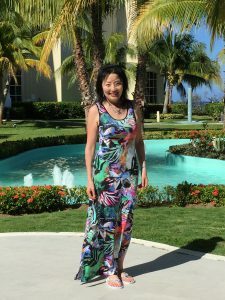 If you want to know why I have this site you can read about me on my About Monica page. I want to tell you what you are missing out on underwater. 1) The Underwater World is the ‘Underwater Garden of Eden’. Did you know our earth is covered with 71% water and yet more money has been spent on space exploration than underwater exploration? According to the National Ocean Service, only 5% of the ocean has been explored. What’s fascinating is, only about 230,000 different species have been named and according to marine taxonomists there are still 1 million and more that have yet to be discovered. The underwater world is still almost virtually untouched. To me, having the opportunity to scuba dive is like having the privilege to learn, explore, study and appreciate the beauty of the natural life of marine fauna and flora. You see, diving has actually made me realize there are purposes to all life on earth. When I’m diving underwater, I think of being in God’s Garden of Eden when I’m hovering over healthy coral reefs unspoiled by human pollution and left untouched by divers. These lush corals, some are beautifully fluorescent blue, green, others are red, pink, orange and brown. Night diving is especially a lot of fun and quite entertaining as you see the nocturnal creatures who were hiding in crevices during the day dives come out in full view. The eels and octopuses are busy hunting for food and the corals which appeared dead are now extending their polyps to grab floating plankton so they too have something to munch on. 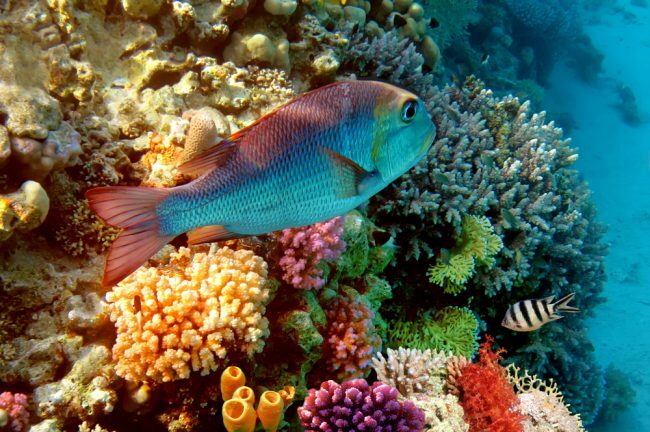 The fish colors are magnificent to see, especially the reef fish who have a variety of colors to protect themselves from predators. There are some fish that glow and they’re born brilliant in orange, red, and neon green and then there are others who simply change colors to match their environment or when they feel threatened. The ocean is waiting for the human eye to make its discoveries! 2) A Place of Peace. When you’ve had enough of life on land, there is no better place to go than to go underwater. You can let go of your land stresses and losses of your loved ones. No land noises. No TV or the buzz from your cell phone. No traffic sounds. No wasting time sitting in traffic. 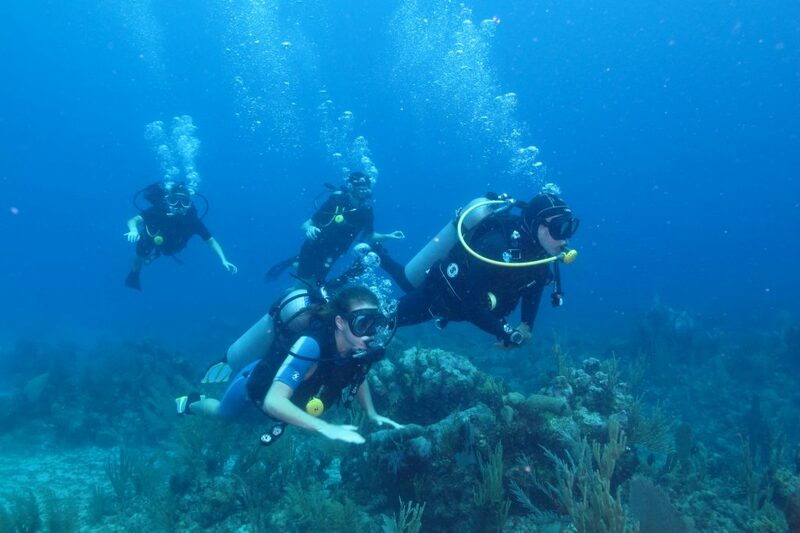 Scuba diving is a great way to get away from campers when you thought you would be able to enjoy your peace and quiet. I can hear my bubbles and the calmness of my breathing and sometimes I can hear the talented humpback whales sing their songs. The faint sound of a parrot fish chewing the algae off coral reefs as they sometimes end up breaking chunks of the coral’s skeleton made up of limestone. These are the pleasant sounds of the underwater world much better than the sounds of traffic on land. Along with the peace, comes great freedom! Scuba diving in my mind, once you get your dive gear on and take that giant stride into the water and make yourself into the depths of the ocean… is true joy and you can’t help but say ‘ohhhh ya, this is what I’m here for…’. 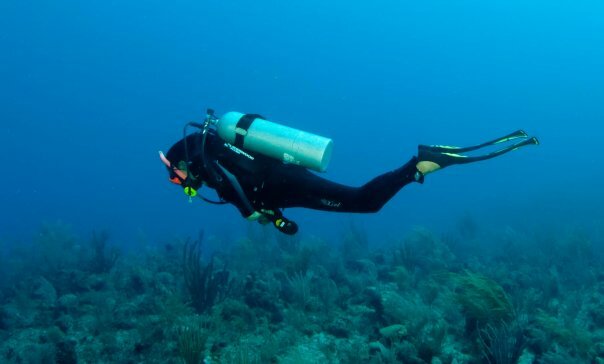 Once you apply the buoyancy skills you learned from your entry-level Open Water Diver Certification Course, it’s easy to obtain neutral buoyancy and control your breathing. Being able to breathe and spend time underwater, to move about gracefully, weightlessly and have the freedom to move up or down are things you can’t do standing on the ground. The sense of belonging to the ocean doesn’t go away even when you’re back on land. 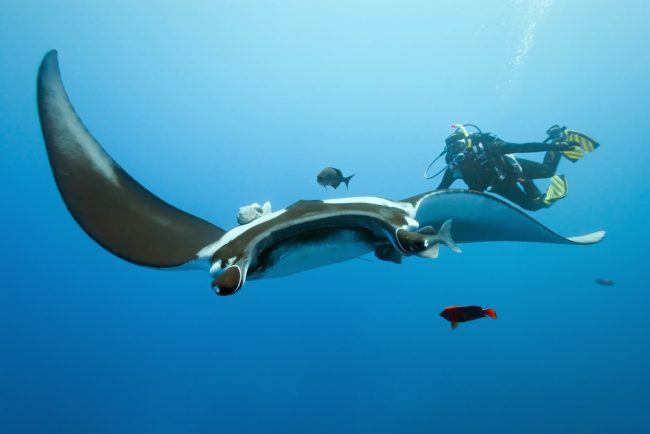 If you have never dived with or seen a giant manta ray, check it out here you’ll understand what I mean. Hanging out into the blue is one of my favorite things I enjoy doing underwater. There is no bottom to see and it truly is a feeling of freedom. 4) The Adventure and Mystery. Another reason why diving is so much fun is the adventure. You actually get to interact underwater and swim with the marine creatures instead of standing in front of aquariums watching them helplessly trapped with no place to go. Every time you go diving whether you go to the same site, it’s always different. No dive is the same. Even your dive buddy who is diving with you will have different experiences on the same dive. Each site presents itself with unique stories from histories of wrecks to giant marine creatures suited for its environment. Sometimes you might even get the feeling of ghosts of sea crews who never survived, watching you cautiously as they protect their sunken ship. You’re curious and you need to explore and investigate how such a tragedy even occurred. At first, it appears as just a large dark shadow. As you get close, you can see an outline of a huge broken ship and closer yet, you can see how the ship became a prisoner to the ocean. It’s completely covered with beautiful coral and an abundance of different fish swimming freely in and out of the ship’s openings. 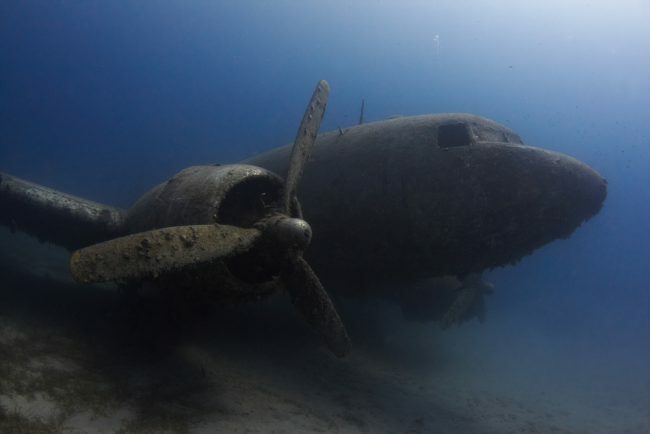 From historical shipwrecks, automobile wrecks and WW2 airplanes, wall diving with a 7000 feet drop (Grand Turk, Turks & Caicos), the Great Blue Hole a giant sinkhole off Belize’s coast, the world’s great cave Cenote Angelita in Tulum, Mexico are just a few of the amazing underwater wonders that will make you squirm and shiver with delight. These thoughts linger in a diver’s mind and the urge to go diving begins again. There is no other way to appreciate the natural beauty and feel the adventure than to actually do it. 5) Travel And Explore All Over The World. 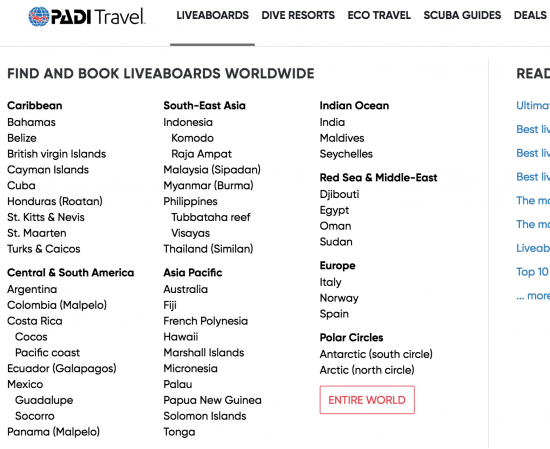 You can dive anywhere in the world, from the tropical warm waters to the cold waters whether it be from the Red Sea, the Philippines, Australia’s Great Barrier Reef, Caribbean, and the Antarctic. The fun part of diving too is you don’t have to stay at resorts. Sometimes the best dive sites are at remote locations where the smaller dive boats don’t go to. Liveaboards are perfect to take you further away because you can live and dive from these larger boats and are usually much cheaper in cost as well. Vacationing on a liveaboard means you can bring your family and they can also have fun and snorkel. Perhaps they would like spend some time in a spa or be pampered with a massage. Watch movies, go to the deck and lounge, go on shore for beach walks are some of the activities. Liveaboards actually offer some of the best meals prepared by their talented and entertaining chefs. You will never go hungry. 6) Meet And Swim With Interesting Marine Creatures. Watch this video of a shark needing help…. ﻿ Why see the marine creatures in magazines, aquariums, National Geographic, YouTube videos, and Netflix? Why not be underwater totally submerged with them? When you live the dream, you will never let it go, no matter how old you are! I remember watching the Steven Spielberg’s film Jaws twice and it did make me quiver with fear. The truth is, sharks are not scary and they mean no harm to us, in fact when you see them in their environment, they’re very shy. We’re definitely not in their meal plan because we’re too bony. Some sharks may be curious and they just want to check you out. There are many divers who are extremely passionate about sharks and they make it their lifetime project to keep them safe. Did you know humans are harmful to sharks? Some commercial people kill them by mercilessly cutting off their fins and letting them bleed to death just to make fin soup. Swimming with dolphins is a lot of fun and when they’re not on a mission, they’ll play and perform for you sometimes for the entire duration of your dive. The giant manta rays and the whale sharks, graceful in their every move, have no real teeth to munch on humans. Their diet, even with their large size and huge gaping mouth is to feed on tiny plankton. Sea turtles will quite often swim right up to you because their eyesight is not very good. These beautiful giants are so much fun that you will never want to leave the underwater world for they will entertain you and let you swim beside them. It’s really touching and will get you teary-eyed when an injured sea creature comes to you for help because of what mankind has done to them. They are not a danger to humans, we are their predators! Respect the marine creatures and they will respect you back. 7) Great Way to Meet Other Fellow Divers. I travel on my own because my friends don’t ‘really’ dive. It’s quite easy to meet other divers from all over the world. This is another reason why diving is so much fun. I discovered there are lots of divers who travel on their own. The cool part is sitting down together talking and sharing dive stories. You exchange names and contact information and just like that, you’ve bonded and made a lifetime friendship where occasionally they will cross your dive path again. You can keep in touch with them on social media and share dive stories. Your children can take dive lessons from a PADI Instructor as young as 10 years of age by doing PADI’s Junior Open Water Dive Certification Course. The Junior Diver must be accompanied by an adult diver on every dive and can dive no deeper than 40’/12m. When the Junior Diver becomes 15 years old, then the credential is automatically upgraded to the Open Water Dive Certification at which time the young diver can then dive to a maximum of 60’/18m. PADI offers eLearning for lessons online but due to internet laws internationally, the youth must be no younger than the age of 13. I’ve seen 10 years olds scuba dive and they’re a lot more relaxed than adult divers in training. Some of the dive youths move on to make scuba diving a professional career as Scuba Dive Instructors or become Marine Biologists to study and protect sea life. Some look for more adventure and specialize in wreck or cave diving in their later years and the rest will enjoy as recreational divers. 9) Volunteer During Your Dives. After you become a certified diver, why not be part of a marine conservation team as a volunteer during your vacation? This is one of the best ways to learn about some of the world’s largest pelagic sea creatures. If you find any unnamed species, you get to name them as well. The thing I find about scuba diving is it’s extremely addicting! You will want to do more traveling. You will come up with so many fish stories to tell your friends… make sure you log all your dives in your dive log book. So what do you think? Have I convinced you to get into diving? 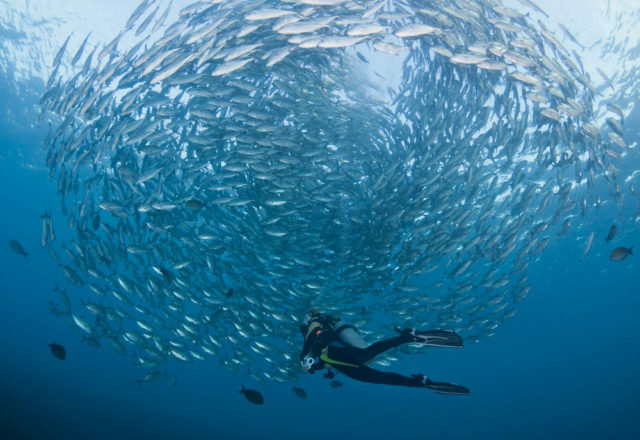 Do you want to know the best places to go scuba diving? Want to Grow Your Knowledge of the Ocean and Gain a Deeper Appreciation for the Environment? Check here to get more information to how you can become a scuba diving and when you’re certified let me know. I really want to hear your dive stories. If you have any questions or comments or want to share the story of your reason to dive, please put them in the Comment Box below! Amazing! I’ve been searching for an article like this. I have always wanted to learn to dive and will check out the info you posted on how to become certified. I love the way you explain how diving is a great escape from the daily grind, and how peaceful it feels. Certainly sounds like a very spiritual experience, and something I would do well to incorporate into my life…! Hi Amy, thank you for your great comment. Fabulous, unique site! I have a 12 year old daughter who for several years has continued to talk about being a marine biologist and now wants to be an oceanographer. She is fascinated by sharks and absolutely loves turtles. I had no idea that they could become a certified diver so young. In your opinion, is the east coast or the west coast of Canada better for diving? Thank you for your great comment and question. Your daughter will have a lot of fun and to be a marine biologist and oceanographer is a wonderful profession to be in. Many young people are realizing the important of protecting the ocean waters and the marine creatures which are all vital to our existence. Personally, I prefer the east coast of Canada for diving. I like the southern part of the Atlantic Ocean because the water is warmer and I see more different kinds of sharks. Thank you for reading my article and I enjoyed reading your comment. I see you are also a passionate diver. Taking pictures is also what I like to do. I took a look at your site and I really like what you have. I will spend more time on your site. I’m just out of town and in an area hit by hurricanes so will have no power. Great idea logging dives online. Catch you when I get back. Hi Monica, this sounds compelling! I have been wanting to learn to scuba dive for a long time now. I haven’t tried scuba mostly because my family has no interest in joining me and we vacation together. Snorkeling is about the most I’ve gotten out of them haha. Maybe if I show them this article they will become interested and join me!! Reading this, I know how to get started on my lessons. Thanks for reading my article. I’m glad you found it compelling. I hope your family will read this and who knows…. you might all be doing the lessons together. You can do the theory online and learn together at home. Let me know if you have any questions.